Are You Tired of Imported One-Use Brushes? - Brushes that are handmade in USA with high-grade globally-sourced materials. They won't drive you insane like some cheap imports. - Seamless double-crimped nickel ferrules that won't shed or break in mid-project. Frustration-free painting awaits you! - Synthetic hairs that ensure smooth flow of paint, last longer than animal bristle, and clean up easily. - Short lacquered wooden handles for comfort and control over fine details. Do What You Love and Unleash Your Creativity! - Use your favorite paints, including oils, acrylics, watercolors, gouaches, enamels, glazes, and gel for nail art. - Apply color to varied surfaces, like canvas, paper, metal, plastic, or ceramics. - Enjoy any project: paint your masterpiece, detail miniature figures, dolls, dollhouse accessories, or plastic models, or have fun with face painting. - Practice different techniques with this versatile set, from precise strokes to fine lines to smoothing and shading. This Kit Features 8 Brushes. Please be sure to see our third image above for detailed size info. • Angle Shaders 1/8", 1/4", 3/8", 1/2"
• Filberts 2, 4, 1/2"
Purchase today for a superior customer experience! - Your brushes come secured in the package to avoid damage during shipment. - Easy care instructions are included for longer brush life and performance. - Risk nothing with an Unconditional 1-Year Money Back Guarantee. Supplies are Limited, so click the "Add to Cart" button NOW and enjoy your new US-Made brushes! EXCELLENT VARIETY: This set features 4 Angle Shaders and 3 Filberts in a perfect range of sizes to suit your favorite technique, so you'll always have the right brush when you need it. A FREE fan brush is also included as a thank you! CRAFTED TO BE PROBLEM-FREE: Made-in-USA quality lets you stop worrying about brushes that rust, shed, and fall apart, so you can focus on your art instead of picking brush hair off your artwork. Durable easy-to-clean synthetic bristles make cleanup a snap. VERSATILE: These brushes work well with various paints and surfaces. Whether you're painting on canvas, detailing figurines, ornaments, or model cars, or enjoying a paint by number kit, you won't be forced to rush out and buy a medium-specific brush. 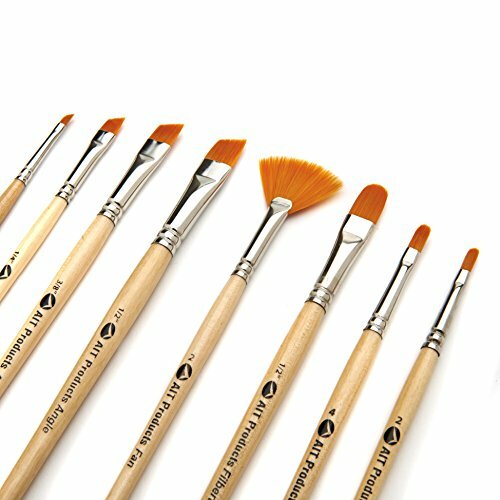 PERFECT FOR EVERYONE: This set works great for professionals, art students, and beginners. Get it for the performance and reliability that serious artists crave, give it to a teen or a child who is taking an art class, or introduce a young kid to the fun-filled world of arts and crafts. ORDER TODAY WITH A NO-HASSLE 1-YEAR GUARANTEE: When you order now, your satisfaction is guaranteed, no questions asked -- you risk absolutely nothing. Quantities of this handmade set are limited, so click the Add To Cart button right away and stop wasting your money on disposable imported brushes. If you have any questions about this product by AIT Products, contact us by completing and submitting the form below. If you are looking for a specif part number, please include it with your message.